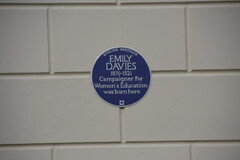 Sarah Emily Davies (22 April 1830 – 13 July 1921) was an English feminist, suffragist and a pioneering campaigner for women's rights to university access. She is principally remembered as being the co-founder and an early Mistress of Girton College, Cambridge University, the first college in England to educate women. 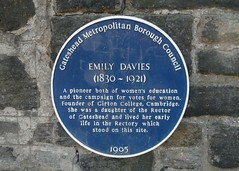 Emily Davies (1830-1921) A pioneer both of women's education and the campaign for votes for women. Founder of Girton College, Cambridge. She was a daughter of the Rector of Gateshead and lived her early life in the Rectory which stood on this site.